Varsh Details is a comprehensive 30-31 page Varshphal report with detailed predictions for a specific year. This Varshaphal report can be cast for any specific year. The incredibly useful predictions made here are not just something that involves the Varshaphal chart but they also assist in better understanding of a natives natal chart, dasha and transit as well. 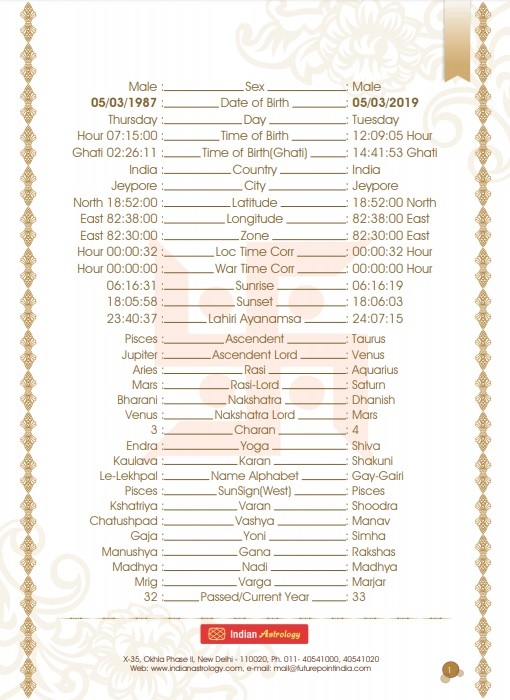 Varshphal Chart, Varshphal Chalit, Varshphal Moon, Varshphal Navamsa etc. After a thorough analysis, it provides a month wise detailed prediction report for 12 months that includes almost each and every aspect affecting our day to day life such as- health, finance, business, family, relationships, society and status, theft, children etc. It provides useful insights into the specific year that we want to know the Varsh Details for. It helps people from the business community in taking informed financial decisions by looking at their favourable & unfavourable planetary transit during the year, thereby turning the risk reward ratio in their favour. It helps professionals know about their career outlook in that particular year e.g. growth opportunities signified in terms of promotion in the same job or a switch with an increase in remuneration & a better job role. It is in particular beneficial for students appearing for competitive examinations in an year, as it reveals the level of help that they are poised to get from the planets during that period. It warns us beforehand if a bad period for our health is slated to come, so that we can take necessary dietary & lifestyle precautions. People who are speculative businesses like the stock markets and trading in the commodity markets can benefit from the useful predictions by taking low risk trades in the year that is does not has strong financial gains signified. It suggests the best periods for property & vehicle purchase and the periods where large investments or expenditures must be avoided. This Varsh Details report provides you with your Varshphal in Hindi as well as in the English language. So, if are looking for your Varshfal by your Varshfal Kundli then Varsh Details report from Future Point is the perfect solution for all your needs.